Selling A House During Divorce? We can pay cash for your Springfield house so that you can split the equity quickly. Going through a divorce is tough by itself. But selling a house during divorce just adds to the stress. Even under the best conditions, there are always challenges along the way. Sometimes, couples are forced to stay together financially due to home ownership. While you have many choices, the best option is to sell. Holding onto the home doesn’t help in moving on. However, it might not be so easy in the current market, especially if you owe more on the mortgage than your house is worth. If this is the case, you’ll need to pay off the difference on the loan or go for a short sale. The downside of a short sale when you divorce selling a family home is that both of your credit scores are impacted. In addition, you both could still be responsible for the difference the house sells for and the amount still owed on the mortgage. However, the bank could always decide to release you from the liability during the short sale. Attempting to refinance your house after a divorce is another option as long as you’re not underwater on the mortgage. This only works as long as one of you agrees to let go of the house and the other, who’s refinancing, has good credit and income. If you plan to keep the home, you’ll want to make sure you can afford all of the expenses on your own. If your spouse keeps the home, don’t expect it to be smooth sailing in getting a mortgage for another home. Sometimes, it’s not so easy getting your name off a mortgage and qualifying for a second mortgage can be tough unless you have a high income. Your spouse might have to apply for another mortgage just so you can get your name off of it. Another thing to consider when selling a house during divorce is housing options in the community where you plan to live. If you decide to buy another home or rent, will your monthly payments be more or less? If you have kids, can you find similar housing in the same school district? What about the costs of moving or even renting a storage unit? You may be in love with the house now and want to stay, but what if during the next two years, you must sell it? You could end up with an expensive capital gains tax. You might be better off trading the house for other assets. As if selling a house during divorce isn’t stressful enough, selling assets before a divorce can also be challenging. If not done correctly, there could be serious tax implications. Liquidating assets, though, should be a last resort due to taxes. However, if you do liquidate assets, make sure you know what you’re dealing with when it comes to investable assets and the costs associated with it. Also, know the cost of a real estate asset and what the capital gain will be when you sell the house. Get a good business valuation and appraisal for any collectibles you may have. Don’t liquidate a 401K or fail to get fair price when you sell an asset. When selling a house during a divorce, again, you also don’t want to acquire a huge capital gain with what you sell. Keep in mind, you don’t have to worry about taxes if you transfer assets back and forth with your spouse. Collaboration is when you and your spouse decide what something is valued at. In most cases, a judge does not get involved. While selling a house during divorce, as hard as it maybe, don’t argue. 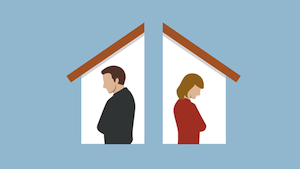 Many real estate agents agree that couples who argue, while selling a house during a divorce, often don’t agree when it comes to routine decisions about fixing up the house, repairing, and even listing the property. This could jeopardize a potential sale and worse yet, the home could fall into foreclosure. So, set aside your differences and sell the house or agree to turn the house over to your spouse or yourself. Another question to ask while selling a house during divorce is whether you live in a community property state. There are only nine of them: Arizona, Idaho, California, Louisiana, New Mexico, Nevada, Texas, Wisconsin, and Washington. In a community property state, all assets acquired by you and your spouse are divided equally at the time of divorce. No other factors are taken into account. The rest of the states have equitable distribution which allows divorce courts to take factors into consideration such as length of marriage, ages, health, and the fact that one parent might have stayed home to take care of the kids. Traditionally, many couples who divorce selling a home hire a realtor they pay a commission to. Or they sell the house themselves but then have the hassle of being in charge of the whole process. Instead, why not sell your home to Ozarks House Buyers! When selling a house during a divorce, I can give you a fast sale and cash. All you need to do is fill out the form to get the process moving. I’m in the Springfield area so can make you a cash offer within 24 hours. In just a few days, you’ll be free of your house and able to move on with your life. You’ll have quick cash and can immediately begin prioritizing your financial goals. This is how to sell a house fast in Springfield. We give you a cash offer within one day and you can close it whenever you want. Your house can be sold in a week! If you need to sell your Springfield area house fast and would like to get a no-obligation cash offer, call us now at 417-323-2611. Whether you decide to sell your house to us or not, we would like to help answer questions you might have about the process. Lucky for you, we buy houses in Springfield. We work fast to get you a no-obligation cash offer for you house within 24 hours. Give us a call at 417-323-2611 or fill out the form below to get started. We look forward to talking with you.